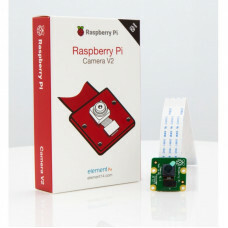 The 8MP Raspberry Pi Camera Module v2 can be used to take high-definition video, as well as stills photographs. It uses high quality 8 megapixel Sony IMX219 image sensor custom designed add-on board for Raspberry Pi, featuring a fixed focus lens. It is capable of 3280 x 2464 pixel static images, and also supports 1080p30, 720p60 and 640x480p60/90 video. It attaches to Pi by way of one of the small sockets on the board upper surface and uses the dedicated CSI interface, designed especially for interfacing to cameras. It is suitable for mobile or other applications where size and weight are important. It connects to Raspberry Pi by way of a short ribbon cable. It’s easy to use for beginners.The camera works with all models of Raspberry Pi 1, 2, and 3. It can be accessed through the MMAL and V4L APIs, and there are numerous third-party libraries built for it, including the Picamera Python library.